While Laurel Park is gearing up for the return of the Fall Festival of Racing – an annual extravaganza that features seven stakes worth $900,000 in purses including the $250,000 Frank J. De Francis Memorial Dash (G3) Saturday, Sept. 16 – trainer Cal Lynch is excited about another looming comeback. Laurel-based Lynch welcomed back M M G Stables' multiple Grade 3 winner El Areeb, regarded as one of the country's top 3-year-olds before an injury knocked him off the Triple Crown trail in late March, to his barn over Labor Day weekend. 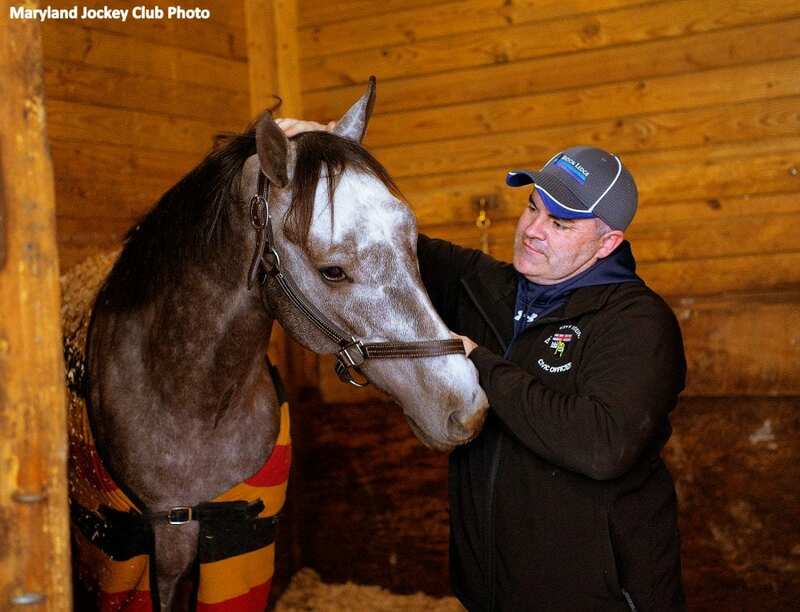 El Areeb, a gray or roan son of Exchange Rate, had been with trainer Bruce Jackson at the Fair Hill Training Center in Elkton, Md. since mid-July continuing his recovery from a knee injury suffered during a March 29 workout at Laurel during his preparations for the April 8 Wood Memorial (G2). At Fair Hill El Areeb was able to utilize the AquaTred, an underwater treadmill that eases the stress on a horse's joints. El Areeb had a small fracture of his knee repaired April 3 at the New Bolton Center in Kennett Square, Penn. by renowned surgeon Dean Richardson. Lynch said it didn't take long for El Areeb to settle in and display his familiar feistiness around the barn. El Areeb put together a four-race win streak starting with his maiden victory and his first stakes triumph, the James F. Lewis III, both last fall at Laurel. He kicked off 2017 with successive wins in the Jerome (G3) and Withers (G3) prior to finishing third as the favorite in the Gotham (G3) March 4, his most recent start. M M G's Mohammad Al-Gadhi continues to be very patient with the handling of El Areeb, purchased for $340,000 as a 2-year-old in training last March in Ocala who has earned $364,200 from seven starts, four of them wins. Lynch has Narrow Leaf Farm's Cheese On nominated to Saturday's $100,000 Laurel Futurity for 2-year-olds going six furlongs on the grass. The Scipion gelding won his first two starts going five furlongs, a maiden special weight event June 17at Laurel and a July 15 optional claiming allowance at Delaware Park, before finishing fourth in the 5 ½-furlong Strike Your Colors Aug. 10 at Delaware. All three of those races were run on dirt. Other stakes on Saturday's Fall Festival of Racing program, all on turf, are the $150,000 All Along, formerly the Lady Baltimore, for fillies and mares 3 and older at 1 1/16 miles; $100,00 Laurel Turf Cup for 3-year-olds and up at 1 ½ miles; $100,000 Laurel Dash and $100,000 Sensible Lady Turf Dash for 3-year-olds and up at six furlongs; and $100,000 Selima for 2-year-old fillies at six furlongs. Entries will be take and post positions drawn for Saturday's card on Wednesday, Sept. 13. This entry was posted in Racing and tagged aquatred, bruce jackson, cal lynch, dean richardson, El Areeb, exchange rate, fair hill training center, jerome, laurel, laurel park, m m g stables, mohammad al-gadhi, new bolton center, Withers by Press Release. Bookmark the permalink.